Tokugawa Nariaki: Devil or Saint? Who knows?!? If anybody was the living embodiment of Mitogaku and all of its inherent contradictions, it had to be the retired lord of Mito himself, Tokugawa Nariaki. Outspoken, brash, lecherous and just plain clever, Nariaki was certainly one of the more colorful personalities that strutted across the early Bakumatsu stage. In the theater-in-the-round that Japanese politics devolved into as a result of the Perry expedition, all eyes were on Nariaki, who certainly dominated a large part of the action on center-stage. Wherever he went, whatever he said or wrote, controversy and riotous debate followed. 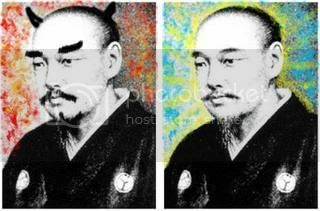 He had a powerful voice that projected his message to all corners of the empire, no doubt rankling the ears of the Bakufu and certain powerful fudai daimyo. However, Nariaki’s soliloquies on how to remedy Japan’s ills and successfully deal with the ‘foreign issue’ found an adoring audience among reform-minded daimyo, courtiers within the halls of the imperial palace, and among all strata of samurai and commoners alike. Yet just what was Tokugawa Nariaki’s message? To a lot of us living in the here and now, at first glance, the message looks garbled if not just downright confusing. Trying to decipher the message has led to many of those now famous ‘Bakumatsu headaches’ that some of us have been complaining to each other about recently. How can it not? Nariaki was a walking bag of contradictions. It’s a lot like some of the contradictions we all studied in high school world history classes about Europe in the age of ‘enlightened despotism’. I think it is safe to say that Nariaki was an enlightened feudal lord cut from a mold very similar those of the ‘enlightened despots’ of the European variety, and in some ways, he’s even more difficult to analyze than Frederick the Great, Louis XIV, or Catherine the Great. When it comes to Tokugawa Nariaki, “pro-reform/reactionary conservative; xenophobic/eager to import foreign ideas and technology; pro-Tokugawa/pro-Imperialist” are all words and phrases that are commonly used to describe him. To unravel his message, let’s take a look at his policies and what he stood for and in the process clarify some of these contradictions. Thus, as we can see, Nariaki’s views quite neatly fit inside the Mitogaku interpretation of the Confucian social hierarchy triangle. And to help ensure that merchants remembered their proper place in the pyramid’s lowest rung, Nariaki enacted strict anti-commerce policies that were designed to discourage the growth of the merchant class’ power as well as to help keep farmers on the land, rather than try their luck as shop keepers or traders in urban centers. As for samurai, Nariaki felt that their decline in fighting ability and moral righteousness were due in part to commercial-related activities, giving him another reason to crack down on the merchant class. He, like Shimazu Nariakira, was also against the giving of two swords and a surname to merchants who sought to buy samurai status. It was an outrage to allow bushi status to be bought. And by allowing this sort of thing to happen, samurai morale, morals as well as ethics would erode. So, what is the substance of Nariaki’s domestic political reforms? He seems like a classic Confucian conservative, does he not? If you agree with that statement, than it shouldn’t surprise you that in essence, Nariaki strove to bring his han back into a traditional Confucian framework that was envisioned by Ieyasu, but of course, with the emperor at the very top of the pyramid. Strong and just leadership combined with the enforcement and study of strict moral and ethical guidelines that constantly reminded all classes of their place, duties and obligation to respect society’s structure, would serve as a bulwark against the erosion of domain strength. Nariaki believed, as did many of his fellow daimyo, that if enactment of this ideal ‘reactionary’ neo-Confucian social structure could be replicated in every han, all would be well and Japan’s domestic troubles, as experienced in the Tempō period, would not and could not occur again. In nearly all that he did, Nariaki strove to instill his ‘reactionary’ domestic reforms in a way that would preserve his ability as an individual daimyo and that of his beloved han to operate as independently as possible from Bakufu control. This makes perfectly good sense if you agree with Beasley that a feudal daimyo like Nariaki only had three things to be afraid of: Bakufu intrusion from above, peasant rebellion from below and foreign attack from outside. Makes you think Nariaki is really in it for himself, doesn’t it? Xenophobic/Eager to Import Foreign Ideas and Technology It was Mitogaku that first coined the catchphrase sonnō jōi, and as spokesman for the movement, it is clear that Nariaki didn’t want Japan’s ports opened to the West nor did he want foreigners on Japanese soil in any large numbers. However, Nariaki wasn’t opposed to the importation of foreign ideas, education and technology--if it could be used to strengthen Mito and the various han throughout Japan. Again, Shimazu Nariakira, daimyo of Satsuma, held similar views to Nariaki—after all, he too, was a follower of Mitogaku, Nariakira built Japan’s first steam powered ship, established a telegraph line, started making modern weapons and other products—all aimed at strengthening Satsuma’s military and economic strength. Mito, not having the financial means as Satsuma, followed similar lines, but Nariaki’s economic view of the world was more agrarian-centric, as rice, not industrial products, served as the backbone of the Japanese economy and society. Nevertheless, from the 1840s, Nariaki argued to have the Bakufu’s prohibition on building large-ocean going ships overturned as he felt that there was a need for a strong navy. And once the Bakufu reversed course on the building of large blue water ships after Perry’s first expedition, almost immediately, Mito ordered one of Japan’s first western warships from the Dutch. Nariaki also tirelessly called for an overhaul of the baku-han military system in order to ensure Japan could enact jōi when the time came. In other words, it was acceptable to hold foreigners in contempt, but their goods, services and ideas, if they could be used to defeat or hold at bay those same foreigners, were perfectly okay! I just can’t help to wonder how if Nariaki really felt that in order to import all of these concepts and build up Japan’s defensive capabilities, was the open port of Nagasaki, along with its heavy restrictions placed on the Chinese and Dutch traders, enough to guarantee a big enough trickle of practical ‘barbarian’ ideas and goods? Pro-Tokugawa/Pro-Imperialist This is the last contradiction that I’d like to take a look at. We know that Nariaki was probably the loudest daimyo when it came to preaching loyalty to the emperor, as espoused in Mitogaku. As a Tokugawa, and a descendent of Ieyasu and a blood relative of the shogun, it may strike people as odd that Nariaki sought to put the emperor above the shogun in the social and political order. But that’s exactly what he did. He even would go out of his way to point out, as he did in a letter to Abe Masahiro in 1846, that although Japan had been a ‘Tokugawa’ country since Sekigahara, there was no law or guideline saying that it should always remain this way. If the Bakufu failed to act to secure the safety of Japan in a time of crisis, others, such as some tozama daimyo, may accuse the Bakufu of failing to live up to its obligations, and an overthrow of the Tokugawa could then become a reality. To avoid this from happening, Nariaki argued that remaining passive and awaiting the outcome of events before making decisions was not an option. He continuously pushed for more proactive policy-making and planning on the part of the Bakufu. Looking at the above paraphrased letter, it makes Nariaki look like soothsayer, as what he said could happen, eventually did in 1868. And it is clear, that although Nariaki noisily advocated that everything and everyone was subservient to the imperial throne, he did not want to see the Tokugawa fall from power. After all, Nariaki was a Tokugawa and he owed his own life of privilege to the very system that was in place. He clearly did not want the system to fail! Whether regarded as an devil a saint or a walking bag of contradictions, Tokugawa Nariaki is truly one of the more interesting, yet puzzling figures of the Bakumatsu era.